Being a part of Thar Desert, one is reminded of the contrast between Rajasthan’s desolate sand dunes vis-à-vis Gujarat’s snow-white salt marshes. Camels strutted along the Rann escorting both kids and adults throughout the desert. During monsoons, the Arabian Sea covers this flat land. As temperatures rise and summers beckon, the water recedes leaving behind salt marshes. Over the infinite salt pan, a hot mass of vermilion orange sun set over. I looked at the wrinkled faces of the herdsmen and musicians, and thought how lucky they were to behold the sight of thousand such splendid sunsets. Do they appreciate the beautiful transformation of skies? Do they feel the goosebumps like me? Is it just an everyday mundane that they dispose of without a second thought? Probably to them, the excitement lies in occasional visits of the tourists; only time in the year when they earn more than usual. 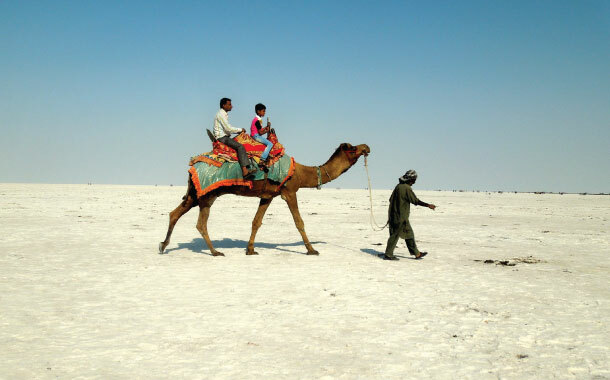 Calm, charismatic and enigmatic is the Rann of Kutch, the White Desert, an oasis in an otherwise deserted village of Dhordo. Dhordo in Kuthchi means white and Rann means desert, explained Nileshbhai. Owing to the seasonal white stretch of salt marshes, the village derived its name. The village of Dhordo is about 85 kms from the Bhuj railway station. This barely traceable village is host to the Rann Utsav, a festival that celebrates arts, culture and beauty of Gujarat under one roof. 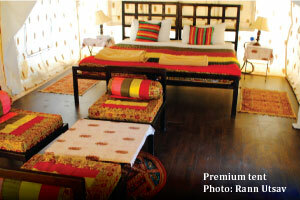 Rann Utsav’s tent city is perched on arid, barren and cracked land, occasionally speckled with xerophytes. Engineering an entire tent city in a godforsaken place is extremely commendable and the arrangements made by the Gujarat Tourism Board are truly praiseworthy. Lots of planning and execution took place to develop a complex sprawling over an area of about 500,000sq.mts. More than 350 tents with several blocks for entertainment, dining and activities are set up. In the night, the temperature dropped down to 8°C and wearing winter warmers was inescapable. I donned my thermals and sweatshirt, which provided me with the much needed warmth. After savouring a hearty Gujarati thali, I went for the cultural night show where musicians, dancers, comedians and puppeteers kept us entertained. Beautiful Kutchi folk melodies filled the air. Rustic voices of the singers and melodious tunes from traditional Kutchi instruments like Narr, bhorr, jhanjh and the like still resonate vividly in my mind. Star gazing area is behind the cultural stage. You may observe the stars through a telescope during the interim change of acts. This activity is free of cost. During your stay in the tent city, you may try out various facilities like star gazing, ATV (All Terrain Vehicle) ride, tandem bicycle, para-motoring, archery, Trikke, Segway PT, rifle shooting, bungee run basketball, velcro wall climbing, sumo wrestling and photo booth. Some of these facilities are at an additional cost. 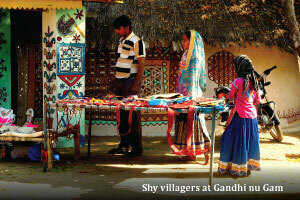 On the second day of my stay, I went to the handicraft villages in Kutch. Kutch comes from the Kutchi word Kutchua or Kutchbo. The map of Kutch resembles the shape of a tortoise. 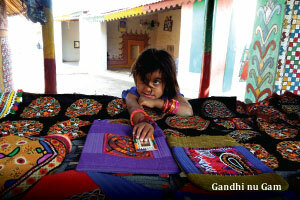 You’ll find no dearth of handicrafts when you are in Kutch. On my visit to Gandhi nu Gam, I saw intricately embroidered bed sheets, cushion covers, purses, wallets, ghagra-cholis, shawls and furnishings. The villagers meticulously craft these as a part for their routine. Beaded accessories like hair clips, bands, bracelets and bangles added range to their artisanship. 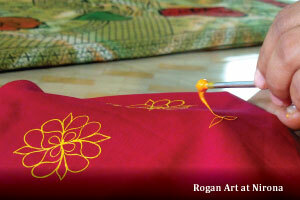 Nirona is home to Rogan Art, only place in the world that stood the test of time and preserved this traditional art. The Khatri gharana (lineage) has been pursuing the ancestral art of procuring lacquer from trees and mixing it with oil and coloured chalk to create naturally indelible sticky colours. 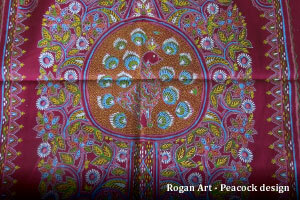 The Khatris are excellent hosts and demonstrate Rogan Art to every visitor. Nearby, lies a bell-maker who uses ancient technique to make various types of bells - cowbells, iron bells, wind chimes and many more varieties. 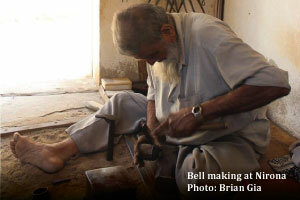 This bell-maker also demonstrated an intriguing session on bell making. 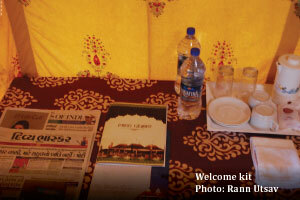 Such interactive experiences with locals enriched the experience of my Kutch holiday. 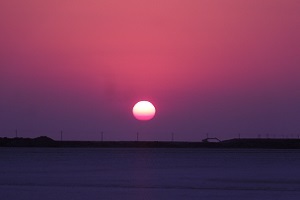 In the evening, we went to see the sunset from Kalo Dungar, the highest point in Kutch. The endless expanse of Rann of Kutch was distinguishably visible from the vantage point. Watching the sunset atop Kutch was truly a mesmerising experience. Next day, on my way back to the station, the Gujarat Tourism Board offered complimentary sightseeing to Bhujodi, Aina Mahal, Prag Mahal and Shri Swaminarayan Mandir. Do try the ‘masala cone’ at Bhujodi, a cone made out of maida (all-purpose flour) filled with a ‘dabeli-like’ stuffing, but not the same in its entirety. Both Gandhi nu Gam and Bhujodi have excellent garment options. As I entered Aina Mahal and Prag Mahal, disturbing memories of the 2001 Bhuj earthquake flooded my mind. I had merely seen the wreckage on television, yet the crevices and scruffy ruins of the palatial Mahals took me back to the dreaded time. With a visit to the Shri Swaminarayan Temple, yet another journey concluded; a journey that will always stay in my heart for more than thousand reasons. 1. 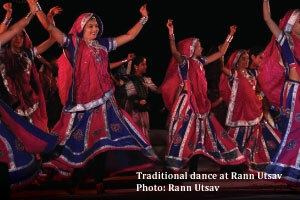 Rann Utsav dates: December 1, 2015 to March 5, 2015. 2. Swiss tents are available in 3 categories: Premium AC, Deluxe AC and Non AC. 3. Packages are available for 1 Night/2 Days and 2 Nights/3 Days only, making it an ideal destination to visit over the weekend. 4. You may avoid staying in AC tents because winters are marked with extremely low temperatures. 5. Carry warm clothes like thermals, sweaters, blankets, gloves and woollen caps. Do keep a check on the weather forecast to gauge the amount of warm clothes needed. 6. Rann Utsav’s hospitality team provides bed sheets, towels, blankets and basic toiletries like soap, shampoo, shower gel, toothbrush, toothpaste, comb and moisturiser in all the tents, irrespective of the category you choose for your stay. 7. All the tents are comfortable and have a self-contained bathroom. 8. Battery powered golf carts run throughout the tent city make navigation extremely convenient. 9. 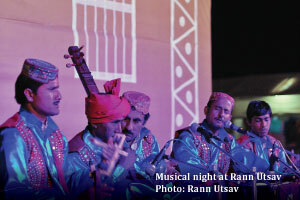 The Rann Utsav package includes all meals (except breakfast on the first day), cultural show in the tent city, back and forth transport from Bhuj railway station or airport, sightseeing, transportation and necessary permits. 10. The proximity of the Great Rann of Kutch to the Indo-Pak border makes it a sensitive area and so the Border Security Force (BSF) heavily patrols it. Therefore, you may be required to stop for security checks. Please oblige with the formalities. 11. 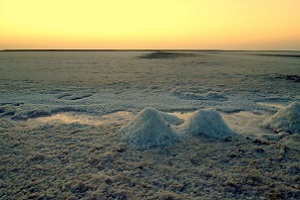 All the tourists require prior written permission to visit the Rann of Kutch. 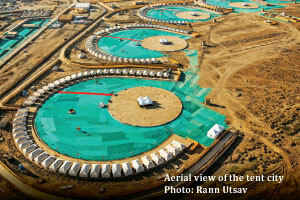 If you take the Rann Utsav package, then you will avoid standing in the long queues to get the permit. The Gujarat Tourism Board takes care of it. You may get your permit from the Bhirandiyara village that falls on the way to Dhordo. The road straight up goes to Kalo Dungar while the one on left takes you to Dhordo. You will need an identity proof to procure the permit. 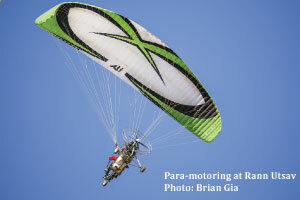 Charges: Rs 100/- for adults, Rs 50 for children and Rs 50 for four-wheeler. Alternatively, you may visit the the DSP’s office in Bhuj to get the permit. The office remains closed on Sundays and on every 2nd and 4th Saturdays. It is near the Jubilee Ground at Bhuj. Musafir.com arranged my trip to the Rann Utsav.